Was quite a nice treat while I was walking along the river since I’ve never seen a pelican before let alone this close and they are bigger than I expected. I mean I don’t think it could eat me but I don’t wanna anger it, my head would fit in that orange abyss of a stretchy neck. There was actually a few more of them up on the old condemned jetty there which they seem to share quite harmoniously with hundreds of other birds included ducks, seagulls, crows, cormorants and probably others. 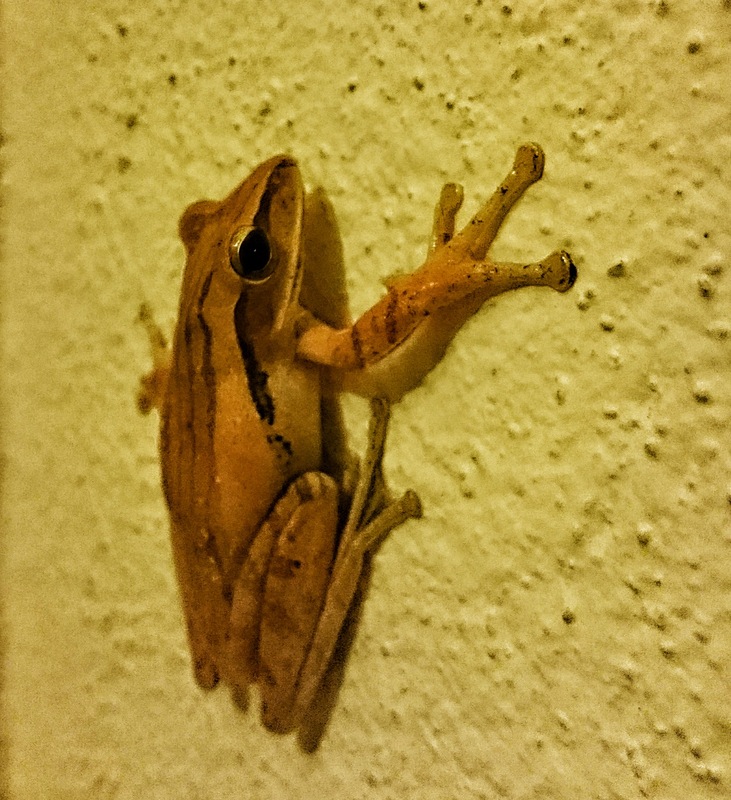 Found this little guy on the wall outside, I’ve named him Terrance the tree frog. It’s surprising what comes in from the jungle near by sometimes. Apparently my uncle once helped a neighbour with a massive python that got a little bit lost. I think he would have kept it too if it wasn’t the perfect size to eat their cat and dog! 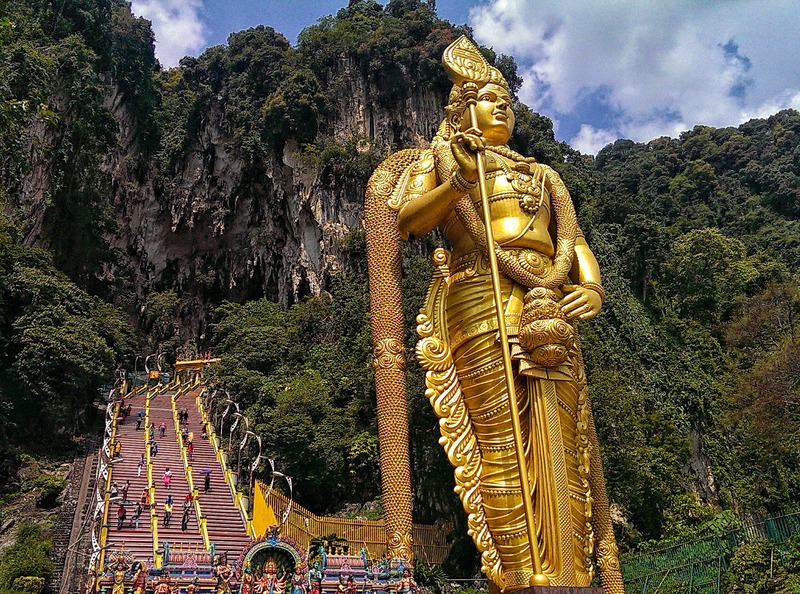 Me and my brother took the train out to Batu Caves today to explore the Hindu temple embedded into the cave. (if you’re afraid of the dark don’t worry, the cave has allot of natural light from openings above) Malaysia has many caves and temples but if you are passing through KL this is an easy one worth checking out. So I’m happy if you take me anywhere with animals.. but monkeys! I love monkeys! Maybe because it’s my zodiac animal, maybe because we share a few hobbies like eating coconut and climbing trees or maybe just because they are so close to being little people. However they are still wild and potentially volatile animals so I was tad scared when my brother challenged me to get as close as I could to one for a selfie. But I like to believe animals can sense I mean no harm and im not a threat so il continue attempting to make fury best friends. I think I almost manage a smile out the monkey at one point.. But I think he’s just smiling at his coconut.. Check out the monkeys! Just don’t startle them! And if you plan to feed them be prepared to be swarmed and your food stolen from your hands. Ideally they should live off the land but I think it’s too late for these guys they’ve had a test of the good monkey life.